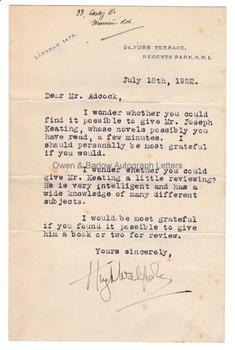 HUGH WALPOLE Typed Letter Signed. Sir Hugh Seymour Walpole. British (English) novelist. TLS. 1p. 33 Cardiff Road, Mountain Ash on 34 York Terrace, Regents Park, NW1 headed notepaper. July 18th 1922. To [Arthur St John] Adcock. "I wonder whether you could find it possible to give Mr Joseph Keating, whose novels possibly you have read, a few minutes. I should personally be most grateful if you would. I wonder whether you could give Mr Keating a little reviewing? He is very intelligent and has a wide knowledge of many different subjects. I would be most grateful if you found it possible to give him a book or two for review. Yours sincerely, Hugh Walpole." 8vo. 18 x 11.5 cms (7 x 4.5 inches). Old folds. A few light foxing spots else fine. Hugh Walpole, author of 'Mr Perrin and Mr Traill', the 'Herries Chronicles' series, etc was one of the most admired and widely read authors in the 1920s and 1930s although in latter days his work has been rather sadly neglected. He had struggled in his youth to find a publisher for his work and, consequently, was known to be very generous in helping younger, aspiring writers. Joseph Keating (1871-1934) was a Welsh novelist of Irish Catholic parentage. His gritty novels of Welsh mining life, adultery and political intrigue were reminiscent of Zola (whose novels he had translated) and had created quite a stir when they appeared but he had made little money, being allegedly cheated by publishers and agents. Keating was reliant for much of the time on writing short stories and articles for magazines. It is in this connection that a kindly Hugh Walpole writes to St John Adcock, the editor of the literary periodical 'The Bookman'. Joseph Keating was born in Mountain Ash, Wales and it is interesting that the address at the head of the letter (in Walpole's hand) is also Mountain Ash.